Iain Duncan Smith, the Secretary of State for Work and Pensions has written an article about St Joseph for the Daily Mail today. See: History's greatest male role model and a humbling lesson for feckless fathers today Let me first say that this is a most encouraging article and it is great that IDS has chosen to write on this theme. I agree with much of what he says and my pedantic quibbles should not overshadow the service that he has done. So let us get the quibbles out of the way. IDS says "I am not a churchman and I am not given to commenting on Christian theology" Since I am and I am, I suppose it is not too surprising that I would take issue with one or two of the comments in the article. I don't hold to the hermeneutic of suspicion in the story of Joseph - the idea that he suspected Our Lady of adultery and that he put her away quietly to save her being stoned to death. As an upright and just man in the culture of his time, he would have been more likely to allow the Jewish law to take its course if he was suspicious in that way. The hermeneutic of reverence is more likely - that he realised that something mighty sacred was going on and felt unworthy to be part of it. However, I can't really criticise IDS for this since some of the Fathers of the Church followed the line he takes. He is also wrong about the betrothal. Mary would not have been an "unmarried mother" since betrothal in the Jewish law was more than our "engagement"; it was a contract of marriage that had not yet been consummated. In parts of our society, too many young men and women grow up without the experience of a loving father. And we seem to have forgotten what an important role a father plays. It’s about far more than earning enough money to provide shelter and place food on the table; it’s about nurturing, support and loyalty, it’s about providing the best male role model that a man can. There is a further niggle in that IDS makes much of "the Christian Church" underplaying the role of St Joseph. This is possibly fair comment since non-Catholic Christians in many cases underplay the role of St Joseph and, let's be honest, the Virgin Mary as well. In the Catholic Church we have underplayed the role of the Saints in the time between the second Vatican Council and the rise of the blogosphere. However the place of St Joseph in our devotion was greatly increased in the 19th and 20th centuries, leading to the enthusiastic (if liturgically questionable) decision of Blessed Pope John XXIII to insert his name into the Roman Canon. If IDS and the readers of the Daily Mail were to read the Catholic press and the Catholic blogs, they would find much enthusiasm for the figure of St Joseph. I have only recently submitted an article for the Christmas edition of the Catholic Herald in which I focus on the person of St Joseph. 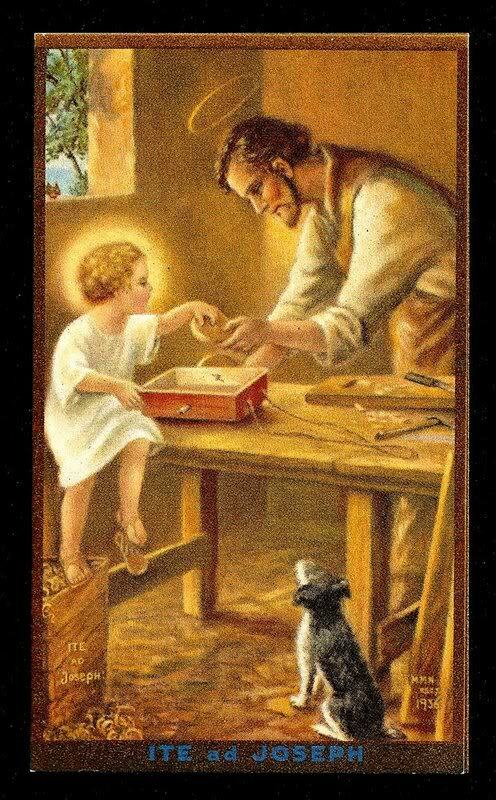 So yes, the right Honourable Minister is right to highlight the role of St Joseph. I would encourage him to see where support for this view lies. He will find many allies in his sincere and helpful reflection.